Active Aquapreneurs - Benvenuti su space2oglobal! The technology partnership between Space2o and Tachyon Aerospace will enable two technologies to come together for the benefit of both water and space exploration. 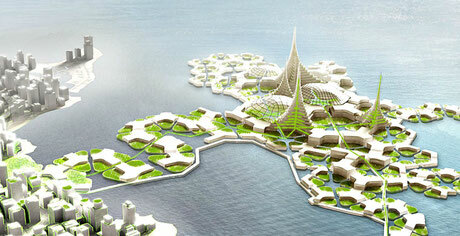 Space2o Aquapreneurs are actively participating on self-sustaining, floating housing communities and underwater human colony development projects. These projects will develop the experience required to finally set the pace for testing future space colony development on planets of our solar system. The underwater environment is similar to space and allows for development and testing of space related technologies. Our society is addicted to fossil fuels. To rid ourselves of this addiction, we need to capture CO2 and use it as a resource to produce biofuels. This requires huge amounts of space. On water, we can do this by capturing CO2 in floating algae farms (to make biofuels, bio plastics, cattle food, fish food, food supplements) and produce food through sustainable aquaculture. At the same time, we can use waste water nutrients and CO2 from coastal cities in a productive way. This allows us to ‘store’ CO2, while keeping the rainforests and fresh water sources intact. Space2o Engineering is in the process of developing futuristic clean energy surface and submersible watercrafts to service the water communities for Space2o Aquapreneurs with the help of Tachyon Aerospace. Liquidspace and outerspace are closely related and we believe that our exploration of the deep will benefit our understanding of the skies. On land, innovation is often constrained by existing infrastructure, energy grids and legislation. But on the water, innovation can run free. 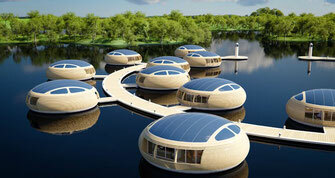 You can also enjoy greater freedom, for example by designing your own sustainable, floating house. Or organizing your own water and energy supply with your neighbours in an off the grid community. Water also offers the ideal element to develop and test outer space survival and travel technologies. An underwater habitat for humans is very similar to a colony on Mars! 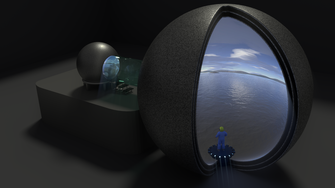 Space2o in cooperation with Architects Giancarlo Zema Design Group can plan and build from floating homes to underwater hotels to colonies on Mars! It often seems that humans can only have a negative impact on nature. That the only thing we can do is try to reduce or – sometimes – neutralize our impact and protect what’s left. But we think we can be a productive part of the ecosystem and have a positive impact on the planet. Floating cities and underwater colonies can be a habitat for us, and for fish, and for other aquatic species – all at the same time. Artificial 3D-printed construction elements can protect us and create a new ecological system – at the same time. Waste water as a resource for food and fuel can also clean up rivers and seas. At the same time we will be able to increase our experience to be able to adapt to life on another planet. International maritime parks can offer ecological tourism and nature protection. Does all this sound too futuristic? Well, it isn’t. The technologies and innovations required have already been developed and successfully applied. Together we can restore the balance and create a symbiosis between population growth and ecological development. We want to gather cutting edge, innovative, disruptive technologies to build the future of mankind with no boundaries. Smart technologies to serve smart cities. The big challenge of future cities, apart from everything else, is to reduce the impact of climate change and global warming. The concept of smart city implies not only a transformation in services management, but also the global connection of citizens and companies through smart devices, providing a constant data flow. The objective is to optimize energy grids to reach efficient consumption and sustainable mobility. Irresponsible growth based on wasting energy leads to environmental disaster. We are taking the first step!